You feel weighed down by all of the stuff you have to do. Everywhere you look, there are reminders that you need to finish something, start something else, and get to work. But you feel exhausted, unmotivated, and you just want to go online and check out for a few hours. If it does, you’re probably overwhelmed by your to-do list. Trying to figure out what to do next can be a huge hurdle when you have so many things you need to get done! If you’re feeling perpetually overwhelmed, it’s worth your time to take a step back and survey what’s really going on. What projects are you working on that are essential? What projects or ideas could be put aside for a less busy season? Taking the time to really assess what you have on your plate and whittling down your projects and to-do list to the most important things can be invaluable! Once you’ve determined your most important projects, you can create a Next Steps list. I’m pretty sure the Next Actions list was the brainchild of David Allen, who wrote the book Getting Things Done. Even though I read Getting Things Done years ago, I didn’t really understand the concept until I took the Steps to Everyday Productivity class. For myself, I call my Next Actions list Next Steps. It’s just a personal preference – for me Next Steps sounds like you’re making progress and moving along productively. 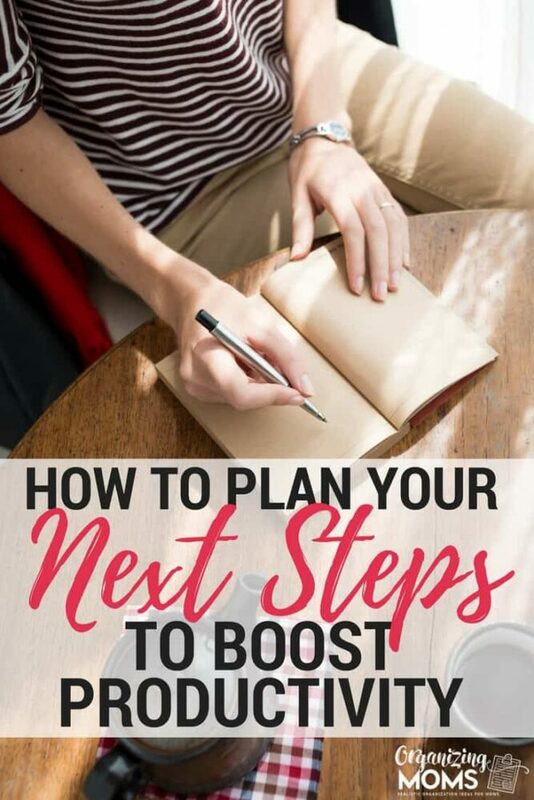 Anyway, the way to make your Next Steps list more effective is to make those Next Steps so incredibly easy that there’s really no reason to put them off. Instead of writing Plan Out Road Trip to Florida, write Ask two friends who’ve been to FL for advice on making the trip. Instead of Clean and Organize Playroom, write Pick up toys on playroom floor. Instead of Write Book About Our Family History, write Make an outline of chapters to include in the family history book. By making your Next Steps easy to accomplish, you keep moving forward on your projects, and you’re more productive! How Do I Figure Out Which Projects Are The Most Important? For most of us, figuring out the most urgent projects is a piece of cake. But trying to really figure out the most important projects isn’t as easy. Identifying the most important projects involves looking at your goals, your values, and honestly taking inventory of just how much you can possibly do without running yourself ragged. But before you can really sit back and assess goals, values, and what your most important projects should be, you need breathing space so you can think. You need for the noise of all of the papers, reminders, appointments, forgotten to-dos, and expectations to just go away. Lately I’ve been taking a course called Steps to Everyday Productivity, and it’s been a game-changer for me. The course leads you step-by-step through a process to create your own Command Central. And with that Command Central, you’re able to easily handle, process, and act on every single piece of paper, request, or idea that comes into your life. 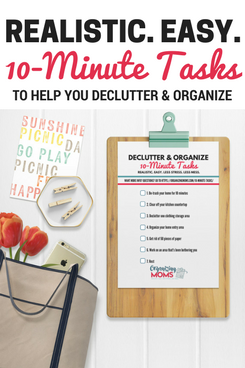 If you struggle with paper clutter, this is hands down the best solution I’ve found for setting up a system that keeps you organize, is easy to maintain, and lasts. It’s completely changed the way I look at my own to-do list, and it’s slowly reducing my overall stress. I used to worry about missing something, or forgetting something. If I stick to the system I learned in STEP, I don’t have to worry about that. STEP uses a lot of the ideas from David Allen’s book, Getting Things Done, but it’s presented in a way that works for families and parents. In fact, I’ve been taking the course with my husband so we can both on the same page. We’re not totally in sync yet, but we’re working towards a common calendar for our family. That’s been incredibly helpful! I haven’t found many other resources that involve your spouse. Not being on the same page as your spouse in terms of organization and planning is a huge issue for most people. How Can I Find Out More About Steps to Everyday Productivity (STEP)? If you’re interested in learning about STEP, I’d suggest signing up for one of their free webinars. Click here to sign up for a free STEP webinar. The webinar will walk you through the basics of STEP. They often offer some great tips and ideas in their presentations. You can also ask questions and see if the program would really work for you. Click here to see more information about the STEP course. Even if you don’t have your most important tasks figured out right now, you can still start using a Next Steps list. If you’re feeling overwhelmed, brainstorm the things you need to get done. Then, pick out the one or two tasks or projects that will make everything easier. Focus on those things that will make everything else easier first. Build your Next Steps around those things so you can start to make progress. That way, you’ll make things easier for yourself at the same time. Check out Things to Do That Make Everything Else Easier for more ideas. 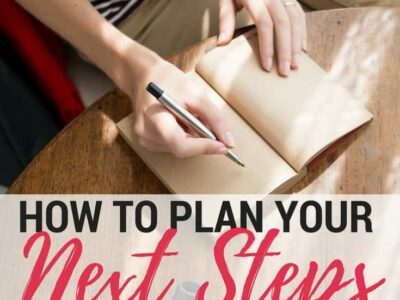 If you’re ready to start making your own Next Steps list, I’ve made a free printable for you to use. Enter your email address below, and you’ll receive it in your inbox! 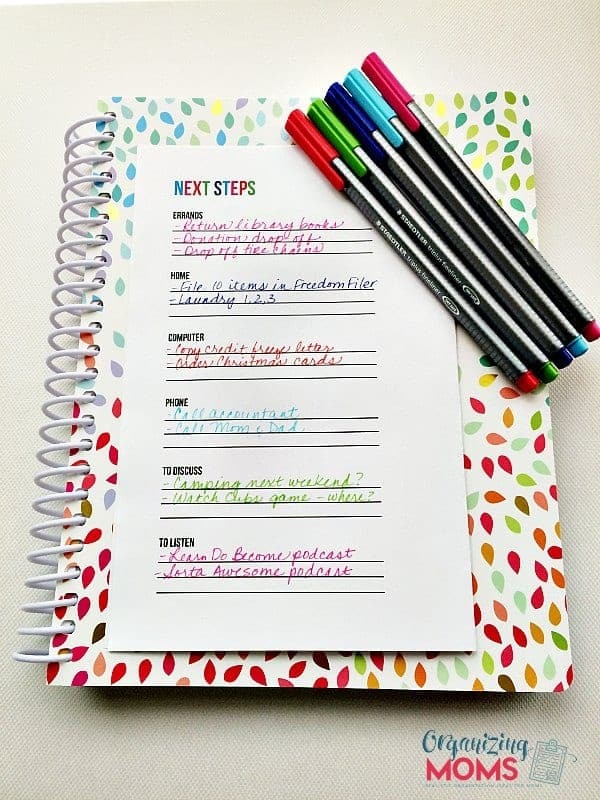 Chart out your next steps and boost your productivity with this free NEXT STEPS LIST printable. It's my gift to you when you subscribe to the Organizing Moms newsletter.